I am a Visionary painter. 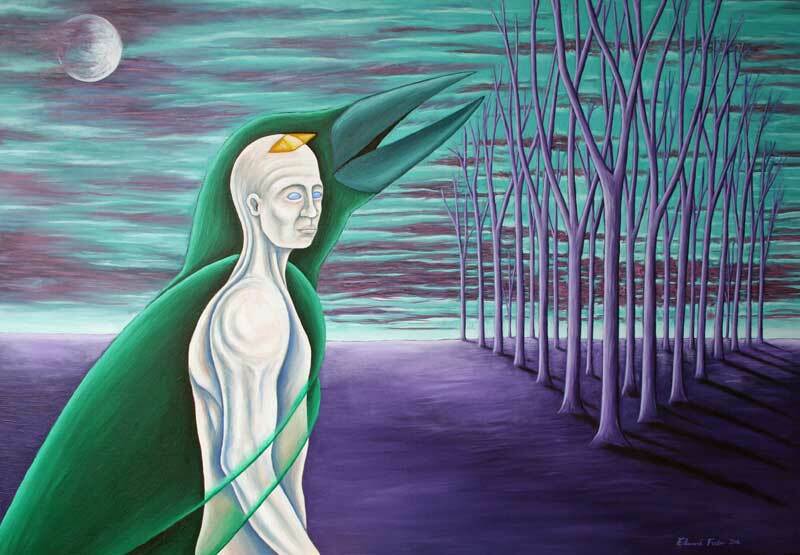 My artwork deals with experiences I have in nature and visions that enter my mind. These paintings can take a long time to conceive; weeks, months or even years. Sometimes they just explode into my mind in an intense moment of spiritual insight almost as if they are sent to me. I will start these pictures with sketches and then build them up into a finished drawing before realizing them on canvas. 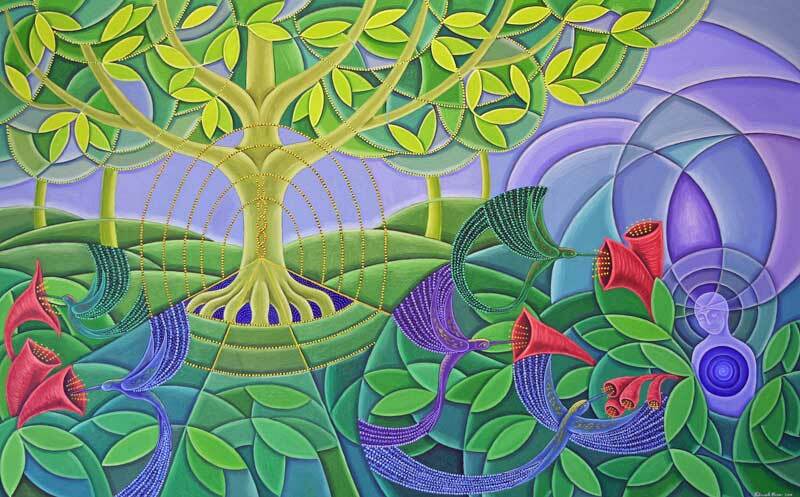 We all have different levels of awakening consciousness and some of us express this through creative mediums like art, poetry, music, dance, and more. 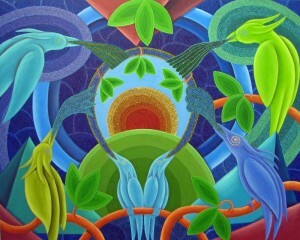 I believe it is possible for us to train our senses into harmony with this and then give self expression to it. Stepping outside of the routine of conditioned daily life and finding the joy of physically and mentally travelling in nature is essential to these deep spiritual feelings. This is a vision of beauty. Gaia is the Earth Goddess and is pregnant with a new dawn. She is nature personified in human female form. 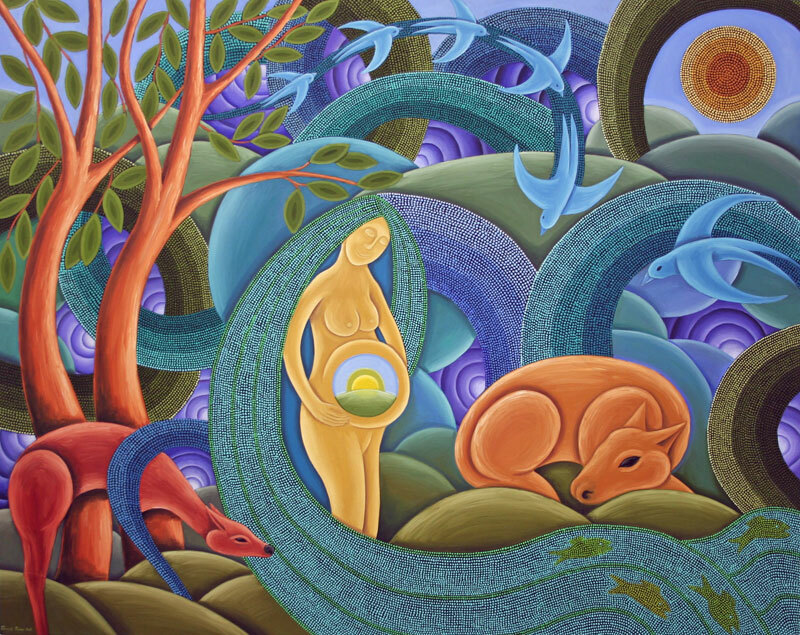 Her hair becomes the rivers and streams, her body the land, and she gives birth to the Earth. I often imagine a Paradise where the sound of birds is heard. This is the portal into it. 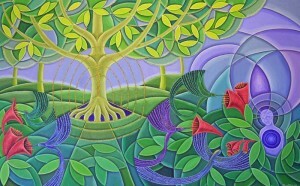 Natural sounds and music help me conceive of visions. We are all connected, we are all Nature. 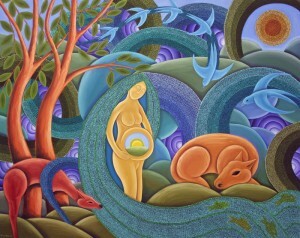 The woman is pregnant and the new dawn holds her baby. 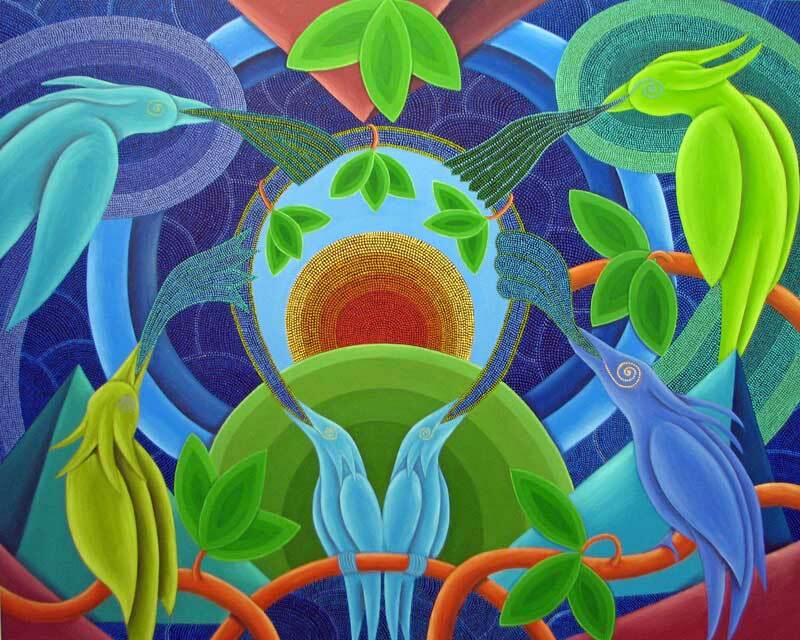 DNA double helixes flow everywhere and the bird sings of it to the new life being born. This is a painting of me alone with nature. Nature here is in the guise of a crow and I can see through its senses by the use of my third eye. My normal eyes are now blank and so I am set free from my conditioned reality. I am the figure in the bottom right hand corner. 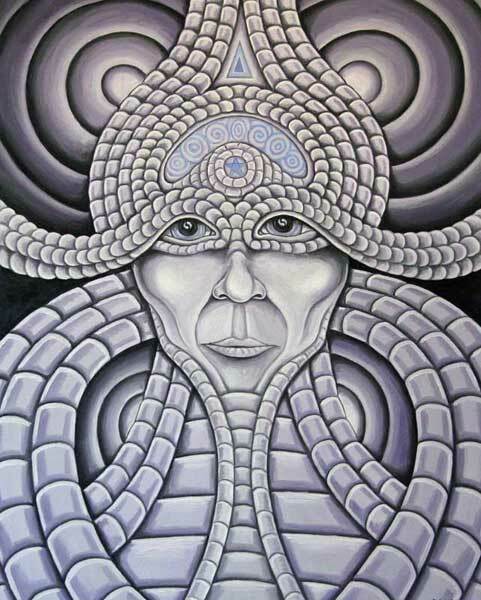 My eyes are closed and so my third eye seeks out a vision of my haven. I have come through a portal into this world of hummingbirds and flowers. 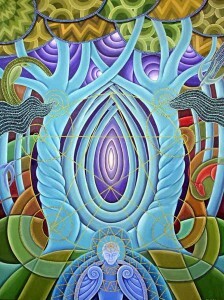 The tree stands over another portal. 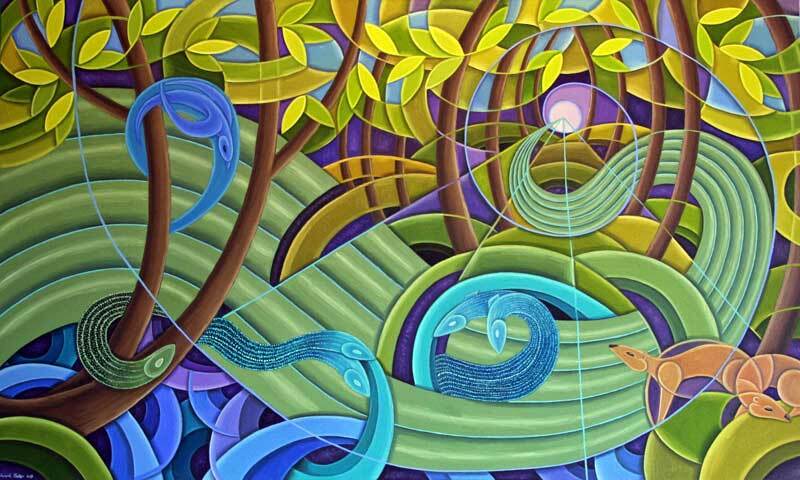 This painting is based around the golden spiral shape (shown by the blue line) which is found in nature and is derived from Fibonacci numbers. Water to me symbolises the great surge of life. 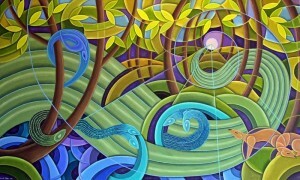 Fish are seen in the water as well as serpent like creatures that come from the abstract realm beneath. 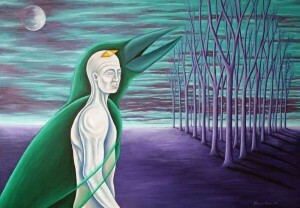 In my painting ‘Pathway’ I have chosen to depict a voyage into the havens of the mind and body. 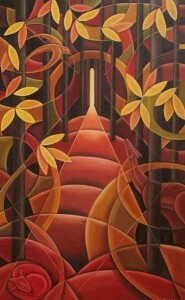 A perfect trapezoid path leads the viewer to the inner doorway of a realm of spiritual awakening. 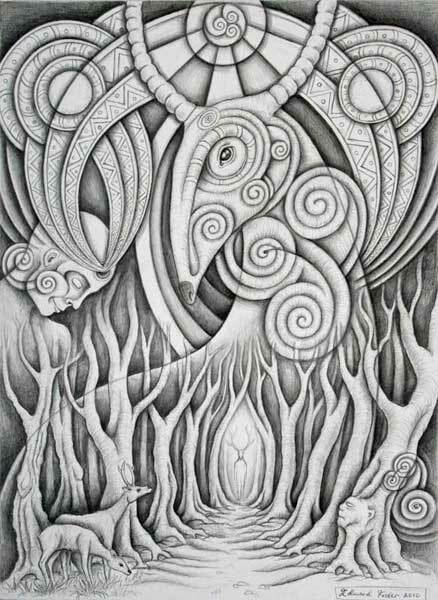 The bird and deer look towards it in the physical world whilst the fox sleeps and dreams of it. 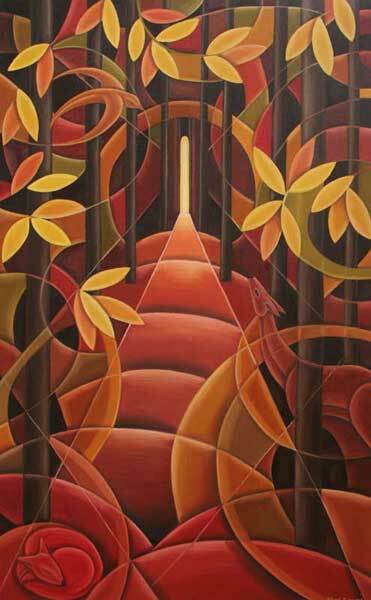 The warm colours help to give a feeling of calmness in the autumn wood. 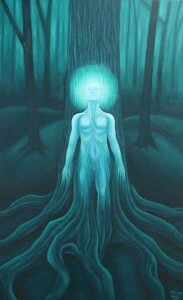 The ‘Awakening’ picture was created after an intense moment of realization when I knew I was part of nature. 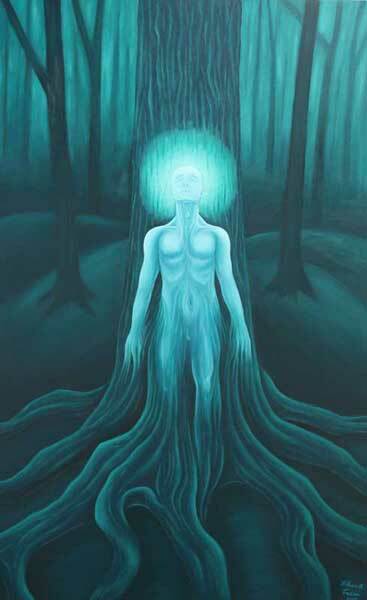 This awakening experience happened whilst sheltering from gentle rain under a tree in the fields near my home. Everything seemed to be of that moment; I felt a calmness come over me and a belonging to the huge power of nature. The painting ‘Meeting’ was an encounter filled with intense feeling. I was walking on the edge of a wood when glancing into it I saw two deer. One of the deer saw me and we stood facing each other for what seemed a blissful eternity, but was just a matter of seconds before they disappeared silently further into the trees. 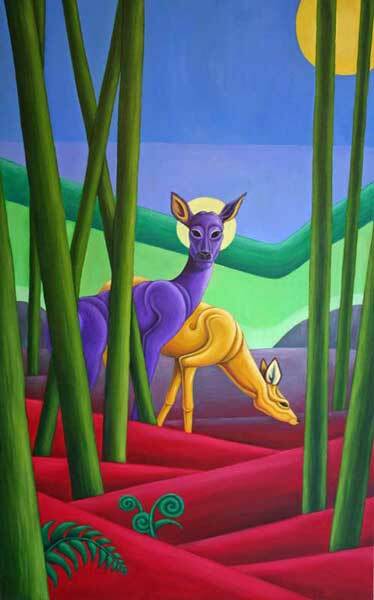 I have painted the two deer purple and yellow to show the calmness of the moment and given the central deer a halo to show its spiritual significance. Everyone has a spiritual animal; the deer is mine. The Doors of Perception, the name of which is taken from William Blake’s quote "If the doors of perception were cleansed every thing would appear to man as it is, infinite. For man has closed himself up, till he sees all things through narrow chinks of his cavern." Sometimes I have visions that come out differently on canvas to what I imagined. It is as though my hand is controlled. 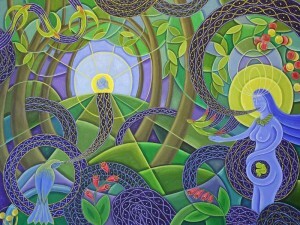 The figure in the foreground has wings that seem to glow and will take him into the womb of trees. A Vision Seeker seeks insights into new realms and travels in these worlds in their mind. 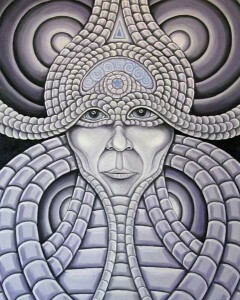 Like most of my paintings the symbols used are from my unconscious and just appear to me. 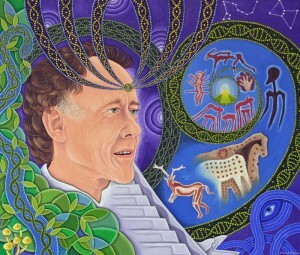 In this picture the symbols cross the seekers forehead and glow with visions. I am the Vision Seeker here. This drawing is based on an actual occurrence. 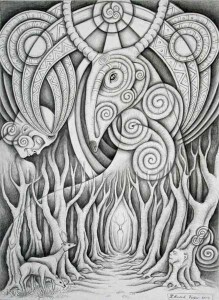 I followed two deer and had a strange experience, where I had a vision of a different realm and felt like I had physically entered one. I found out later that the symbol of Buddhism is often flanked by two deer on gateways to temples. This is why I chose the title.